Preflop, the two players seated to the left of the dealer must place required bets before any hand is dealt, which are known as the ‘blinds’. The player immediately to the left of the dealer is the ‘small blind’ (SB), and the player to the left of the SB is the ‘big blind’ (BB). After each hand, the position of the dealer, SB, and BB rotates around the table in a clockwise direction (to the left) for as long as the game goes on, giving all players the chance to be in these positions. The first stage of the game is known as preflop. Once the SB and BB bets are placed in front of those players, the dealer will shuffle and deal each player two cards face down. Cards are to be dealt one at a time in a clockwise direction, from left to right. 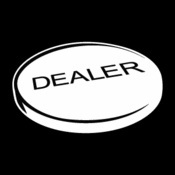 The SB receives the first card and the player with the dealer button receives the last card. These are called the players’ ‘hole cards’ or ‘pocket cards’. Once all players receive their hole cards, the player seated next to the BB player begins the betting round. The minimum or lowest amount that can be bet must be equal to the amount posted by the big blind. Players can bet more than the minimum, this is called ‘raising’. If a player raises, that amount will be the new minimum for this round of betting. The betting continues around the table in a clockwise direction. When the action reaches the player in the small blind position, that player can either call the bet, by putting in additional chips to match the largest bet amount, or fold, forfeiting their chips to the pot. The last person to act preflop is the big blind. The BB player has the option to raise, check, or fold. As long as a player has not raised the BB amount, the BB player is entitled to play the hand. By checking, the BB player would not be required to place any additional chips into the pot. If the BB player wishes to raise, the betting round would continue around the table until each player has matched the bet or folded his hand. Continue reading about the rules of the next betting round called the flop.